This tremendously scenic trail is open to bicycles, pedestrians, wheelchairs, and in the winter, cross country skiers. Along the way one might see goshawks, osprey, great horned owls and deer that live along this shore. At the southern end of this trail, as it winds along the shoreline, we always have to stop for some great photo ops or to just soak up the beauty of the blue lake backed by Mt. Lassen in the northwest and Dyer Mountain to the east. 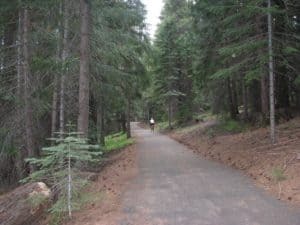 We generally like to access the trail at Dyer View Day Use area where we easily park, read a Forest Service sign about the trail, use the bathrooms, swim either before or after our ride or just sit on one of the benches located nearby and absorb the great beauty of this place. Swimming along the way is always an option but at the swimmers risk as there are no public lifeguard beaches. There are also several other access areas available. The northern terminus begins on the road leading to Almanor West. Another point of access is at the USFS North/South Campgrounds. Turn toward the Lake off Hwy 89 opposite the Almanor Rest Stop. Other entrances include; Fox Farm P.G& E. campground, the Canyon Dam Boat Ramp and several parking areas just north of Dyer View Day Use area via the road to Prattville. I am personally excited to be a part of a group that cleans-up a mile of the trail after winter has taken its toll. With USFS help, each spring volunteers from different groups blow the pine needles, rake fallen branches and re-stain bridges and benches found along the way. You will find more information on this and other trails in the area by stopping in at the US Forest Service on 149 Main Street in Chester, or by picking up a book on local hiking, biking trails at B & B Booksellers, Chester. Bodfish Bicycles and Quiet Mountain Sports in Chester also have a wealth of information on local trails including books and pamphlets the owners of the stores have written themselves.